Eyes Down Ready, Full House for a prize. Everyone wins with a Bingo Night Fundraiser! Bingo in various shapes or forms is popular all around the world. Its a really sociable game, lots of fun and easy to organise. This makes it a great fundraiser for churches, schools, sports clubs or any other non-profit organisation. What's more it can also be a fundraiser parents do together with kids. At its very simplest bingo involves someone calling a series of random numbers usually found on small tiles or balls selected from a sack or by a bingo machine. Players have cards containing a set amount of numbers. If a number is called which matches one on their card they can cross it off. The first to cross off all their numbers (called a full house) wins. 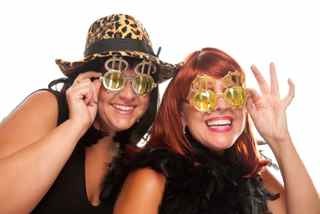 A bingo night is perfect for any organisation looking to hold a social event that will also raise funds. As with all the best fundraising ideas other money making elements can be added around the basic idea. This of course depends on how many people you think you will attract to your event. Church halls, school halls or social clubs are ideal. Most bingo nights will include some form of refreshment so you need to factor in catering facilities and a bar if you require one. Tip: If you are using a school hall venue do please ensure that there are plenty of chairs the right size for adults! This can take many forms depending on the culinary abilities of your group and the facilities at your venue. It is good to include some form of refreshment however to make a real night of it. Often tickets for the Bingo Night can be sold to include some kind of meal. Drink -You will need to offer some form of drink be it soft drinks, alcohol or simple teas and coffees. With alcohol sometimes its easier to perhaps offer food but allow the venue to supply the bar. Another simple option is to have a BYOB (bring your own bottle) system; this also can get you around licensing requirements. Don't forget to state this on your tickets and advertising. Bingo cards can be easily purchased online or from charity supply companies. It is not too difficult however to make and print your own using a simple grid system. 10 - 14 numbers per card is normal. 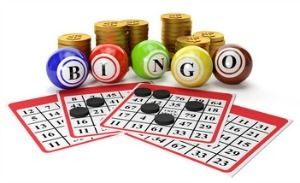 Most bingo sets use numbers 1 to 100. Choose your numbers carefully to include a good spread over the card. It is normal to keep things in numerical order as you move either across or down the card. Some people like to purchase extra cards and will be marking off several at once so this keeps things easy. For a very cheap and easy version you could also simply supply players with a blank grid and a pen. They can then fill in their own lucky numbers before each game starts. Tip: If you do this its fun to get people to swap cards at least once during the evening. Helping or confounding your neighbour with lucky or unlucky numbers results in plenty of good natured banter! Whatever cards you use have plenty of pens on hand for people to use. 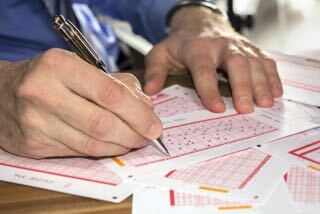 Choosing the right Bingo Caller is very important and can make or break your evening. This is not a job for shrinking violets! You need someone reasonably authoritative but who can also make the night good-natured and fun. It is usual for the caller to sit at the front facing the players. One by one they pull and call numbers either from a sack of tiles or using a bingo machine. These tiles or balls are then placed on a grid for checking winning cards. At the start of each game all the numbers are returned to the sack. Bingo Lingo - It is traditional and greatly adds to the fun of any Bingo Night if the caller uses particular calls for certain numbers. 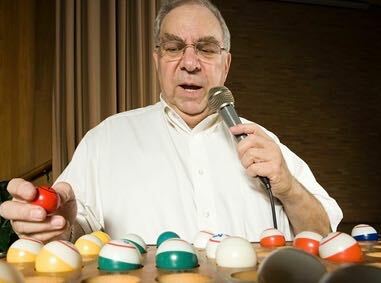 Professional bingo callers develop their own patter and you may have particular favourites. The basic game is, the first person to cross off or cover all their numbers wins. This is called "House". The first player to call "House" has their numbers checked off by the Caller and wins a prize. It is normal however for smaller prizes to be awarded within the game. First "Line" is given to the first complete row. "Corners" is given to anyone completing all four corners on their card. It is best to only include one of these additions each time. Announce it at the start of each game. The number of rounds / games you can play in an evening depends on the number of players and your caller. An average game with 100 numbers will generally take about 15 minutes before a winner is found. The best thing is to be flexible and have plenty of spare cards for extra games in reserve. Prizes - This is really up to you and depends on the nature of your event. 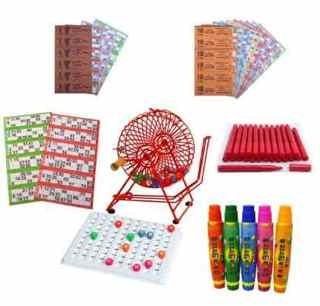 Most charity bingo events are however played for the fun of it and your prizes should reflect this. Funny prizes can add to the success of the evening. School pens for instance make great non-serious prizes for winners of lines and corners. You may like to ask for donated prizes in advance or buy in suitable items. You can charge for the evening in various ways. Some organisations prefer an all in price for the evening which will include a card for every game and refreshments. Others prefer to charge per game. Always offer the option of purchasing extra cards as a way of boosting the night's takings. Do make sure that all your other usual fundraisers, such as items for sale, are on offer during the night. A raffle is also a must and is an extra bit of fun for the middle of the evening. All your players have to come dressed up to the nines in glamourous, over the top evening wear and far too much jewelery. Make sure to award a prize to the King / Queen of Bling! So there you have it. A Bingo Night Fundraiser will perhaps never make you a fortune but it is relatively easy for any organisation to put on. As much as anything else it is a great excuse for getting people together for a fun relaxed evening in support of your cause.